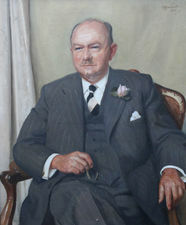 Sir William Oliphant Hutchinson PRSA. Born Glasgow 1863, son of the artist Joseph Henderson by whom he was strongly influenced. Studied at Glasgow University and Glasgow School of Art. His style absorbed much from romantic Victorian realism and he dedicated himself to landscapes, seascapes and coastal scenes. He exhibited throughout his life primarily in Scotland. He was elected an Associate member of the Royal Scottish Academy in 1928 and a full member in 1935.